Lovely progress as always! I see you managed to finish the wings on your fairy. Beading won't take too long, I'm sure. I hope you had a good Mothering Sunday. I found the discussion topic very interesting Jo. I don't do FB or Flosstube so you educated me. ;) And I still feel good with my decision. ha! So much fun to see your 10 a day JN grow (yes, am sure I'm repeating myself). Was just wondering whether you really stop after 10 stitches each day...? You are probably disciplined enough with your stitching to do so, but am sure I'd get all excited about some bit - or just zone out - and keep going. Fascinated by the things you said about flosstube and FB and stitchy blogs, and interesting about stitch from stash reemerging. Am trying to do that myself this year, but it's an effort to get to some of the lovely things that can slip my mind when looking at the new pretties as it is a cost saving effort. Great post Jo! Love seeing the progress on your projects over the month. Your Just Nan piece is growing every day! :o) I have to agree with you re the FOMO theme that is around at the moment.... I generally don't go down all of the rabbit holes but every now and then you can't hep it.... and while I love my needleminders I can't justify having too many more than I already have!! I love all the WIPS. I especially love the way you are personalizing that Halloween alphabet! I will have to look up the info on the Easter blog hop. Somehow I missed it. Lovely stitching,your Spring square is coming along nicely. I enjoyed reading your discussion topic answers. Good progress on all your WIPs!! I am contented with just blogging, I can't manage multiple social networking accounts. Another great month for you Jo by the looks of it! I wonder too how you can have the discipline to stitch just 10 stitches every day. It's very interesting what you said about blogging and social media. I much prefer blogging to other firms of media, somehow it's more intimate and I feel you get to know a stitcher more. I do however love Vonna's floss tube tutorials and there are a couple of other stitchers I like watching on floss tube but I also follow their blogs! A great selection of stitching projects, Jo. Enjoyed reading your comments about blogs, Flosstibe, etc. I only discovered blogs around 5 years and they are my preferred way of keeping in touch with what other stitchers are doing. Other than Vonna's flosstube tutorials, I don't follow them as they are too time-consuming for me. Love all your beautiful progress. Your projects are fun to follow along with. I agree with your answers to the question. I love blog reading and hope that it never dies out. I do pretty good avoiding the FOMO but sometimes it's scary to think I might miss something I couldn't live without haha. Your wips are really beautiful. I enjoy all aspects of connecting with stitchers whether it is Facebook, blog, Instagram or Flosstube. Hi Jo: Great progress, I am envious. This ten-a-day stitching is more than amazing. Each time you show your project I'm surprised how much it has grown since the last time. Nevertheless I couldn't do it because I can't put a project down after only ten stitches, lol. You said it all about blogs. As long as there are enough blog writers and readers I'll stay with my blog as well. And with those who have active blogs.It's just a lot of fun. I can't say anything about FB because I'm not a member, and floss tube is just great to accompany me when ironing and sometimes even when stitching. And fortunately I left FOMO behind many, many years ago, lol. You have a nice variety of WIPs happening! I'm new to the Flosstube viewing world, and am almost overwhelmed at how many videos there are. I know that I'll be sticking to blogging myself. 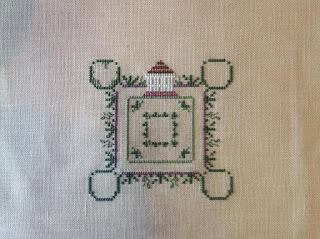 Beautiful stitching, Jo! And "M" have wings now, so very pretty! Since the beginning of the year I spend less time on facebook, more stitching done. I don't watch many flosstubes. I do enjoy Instagram and blogs. Great progress on your projects this month, I'm very much looking forward to seeing the M finished! I had to laugh at you talking about reading blogs in people's voices...that does sound like a lot of fun. Great amount of little x's in this post, well done Jo. Totally agree with what you said re social media and stitching Jo - the very reasons I stopped making videos and left the whole Flosstube hoop-la behind long ago lol! Oh you're right about the FOMO - but I sat down with my stash and WIPs and realised I am happy with what I have. I did sign up to Stitch From Stash but that makes me think twice. Like a chastity belt on my visa! I love watching flosstube. It is so nice to see what others are working on...and yes. They do enable us to buy more and more!!! Will be happy to be in the Easter Hop i you need me!!!! 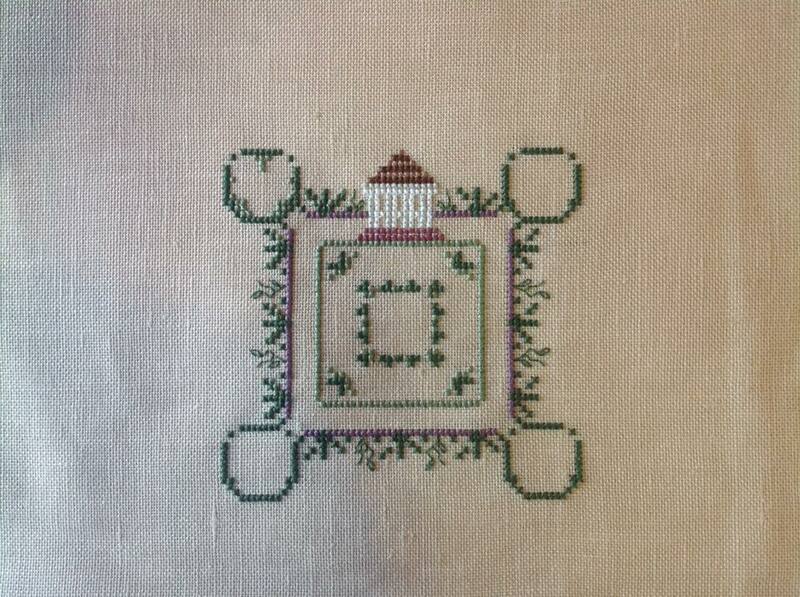 Lovely stitching - you're progressing well!